How to use rejection to your advantage? 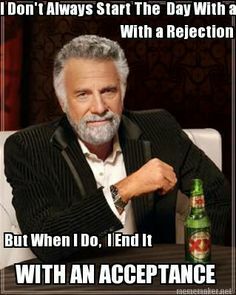 How to deal with rejects? While admits take you to seventh heaven, rejects take you to the bottom of shitpile. I know the feeling because I have been there. I got 9 rejection letters out of 10 when I applied for MS the first time. And 10th admit was from a university ranked lower than 80 and I don’t even know why I had applied there. So, of course, I decided not to go there and stayed back to work for a year. Next year, I was heading to UIUC for a MS in CS that admitted only 18 students. If I had gotten into a 20-30 ranked school the first year itself, I might have gone and probably missed the chance to be at UIUC. That is how I choose to look at my results. And that wasn’t the only unfavorable result I had seen, when I applied to MBA programs the first year, I did not get any admits! Couple of interviews but no final admit – it was heartbreaking and tough. I persisted, applied the second time around and got into NYU Stern! Frankly, I did a lot of introspection the second time around and had a much clearer vision for what I was looking for. And I can tell this with conviction, if I had received an admit in my first attempt, I would NOT have made the most of my MBA because I might have followed the herd, gotten into a stream that I am not that passionate about. When I joined NYU finally, I knew I wanted to work with startups only and had a plan of action. It helped me get a job offer after my first summer itself and I dropped out of the program saving one year of opportunity cost and MBA fee! So, while our results page is full of glorious admits (which have even caught me by surprise), not every result is a positive one. I have a student who has great potential and he has not received admits at par with his capability. It happens sometimes. In this post, I am going to talk about rejects and how to deal with them. I shared my story above to just convey that rejects are not necessarily bad if you do not give up and if you learn from your past experiences. Most of the successful people I know have not been simply lucky, they are just better at dealing with negative results. Did you notice that I haven’t used the word ‘failure’ at all here? It is because these negative results are not a failure by any means. They are only telling you that you should try things differently and get better results. They are telling you to take a breather and punch back harder. Frankly, I am the kind of person who punches back stronger when I am down. I know you are too. So, cast aside your doubts, ego-bruises and take some time off to relax. And, then get back to work – whatever it is that you need to do to leave these rejects behind. By now, if you haven’t received an admit of your choice, you will have to decide whether and when to re-apply. If you have an admit that you are not too keen on (ideally, you should not have applied to such a school in the first place), you should request them to DEFER your admission. Not all schools will allow it but give it a try. Should you re-apply? That is up to you. If you don’t have very long work-experience, it is always worth to re-apply at least once since you have done most of the work anyway. If you decide to re-apply, the most imp question is applying for Spring or waiting till next Fall. I will cover pros and cons of Spring applications in next post. So, stay put for that. Our counseling is open for 2019. Check out our counseling packages here. 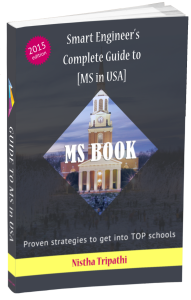 Do MOOCs (online courses) help in MS applications? I am happy to share the news that I have been admitted to the MS in Business Analytics program at the McCombs school of business, University of Texas at Austin 🙂 With multiple brainstorming sessions and tremendously detailed evaluations, Scholar Strategy provided me an exceptional service which was worth every penny. I can’t thank Nistha enough for the help and guidance with the SOP and LOR! I dropped a year due to health issues and used that time to prepare for Masters in US. But this year gap was increasing and joining Scholar Strategy was a wake-up call. I was totally confused regarding the course to pursue and Nistha made it clear to me. She showed me the path to identify my passions. And from there on, the sail was smooth. The timely facebook posts, quora answers, her book, the presentations and the feedback on my documents are very valuable for me. I really liked the personalized experience. Besides the excellent guidance during applications, I think scholar strategy has an edge as it focuses on developing a community which is helpful in quickly resolving queries even after admissions.